Savor your grape-to-glass experience at a one-of-a-kind California wine-country resort and winery. Set within a hand-farmed 5.6-acre vineyard, pair farm-to-table dining and wine tasting, decadent spa treatments and thoughtfully personalized service. The unique Barrel Room welcomes up to 12 guests to feast in an elegant, industrial setting. Gran Roca Spa pampers with signature treatments using mineral-rich mud from the property, and grape seed and olive oil scrubs produced from on-site, century-old olive trees. Therapies continue at the outdoor mud and relaxation garden with steam pods. Swim with vineyard views as dedicated attendants keep you comfortable with fresh towels and refreshments. 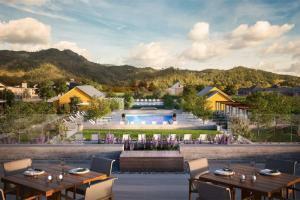 Hands-on winemaking sessions give a taste of Calistoga’s ideal environment (terroir) for Cabernet Sauvignon, while Kids For All Seasons custom-blends Kid’s Kabs from the resort’s vines. On your visit to Four Seasons Resort and Residences Napa Valley, raise a glass and celebrate the Calistoga American Viticultural Area.